Dr. Muhammad Yunus (Bengali: মুহাম্মদ ইউনুস, pronounced Muhammôd Iunus) (born June 28, 1940), is a Bangladeshi banker and economist. He is famous for his successful application of the concept of microcredit, the extension of small loans to entrepreneurs too poor to qualify for traditional bank loans. Yunus is also the founder of Grameen Bank. Known as the "banker to the poor" he is also director emeritus of the Grameen Foundation, which replicates the bank's micro-finance model around the globe. In 2006, Yunus and the bank were jointly awarded the Nobel Peace Prize, "for their efforts to create economic and social development from below" recognizing the important link between poverty and peace. "Lasting peace can not be achieved unless large population groups find ways in which to break out of poverty. Micro-credit is one such means," said the Chair of the Nobel Committee, and "Development from below …serves to advance democracy and human rights." Yunus himself has received several other international honors, including the ITU World Information Society Award, Ramon Magsaysay Award, the World Food Prize and the Sydney Peace Prize. 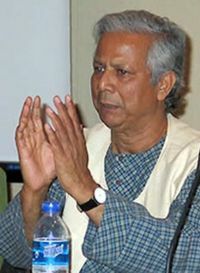 In March 2011, the Bangladesh government fired Yunus from his position at Grameen Bank, citing legal violations and an age limit on his position. Yunus launched a political party in Bangladesh, Nagorik Shakti (Citizen Power). His work has especially empowered women, who represent 95 percent of the bank's clientele. Professor of Economics at Chittagong University, Yunus was determined to make a difference, not just to theorize about poverty alleviation. A member of the board of the United Nations Foundation, founded by Ted Turner in 1997, Yunus collaborates closely with the United Nations. Between 1993 and 1995 he served on the International Advisory Group for the Fourth World Conference on Women in Beijing and from 1993-1995 on the Global Commission of Women's Health (1993-1995). He is convinced that poverty can be wiped off the face of the planet. Yunus was born in 1940 in the village of Bathua, in Hathazari, Chittagong, Bangladesh. His father's name is Hazi Dula Mia Shoudagar, and mother's name is Sofia Khatun. His early childhood years were spent in the village. In 1944, his family moved to the city of Chittagong, where his father had a jewelry business. In 1967, Yunus met Vera Forostenko, a student of Russian literature at Vanderbilt University and daughter of Russian immigrants to Trenton, New Jersey, U.S.A. They were married in 1970. Yunus's marriage with Vera ended in 1977 within months of the birth of their baby girl, Monica Yunus, as Vera returned to New Jersey claiming that Bangladesh was not a good place to raise a baby. Yunus later married Afrozi Yunus, who was then a researcher in physics at Manchester University. She was later appointed as a professor of physics at Jahangirnagar University. Their daughter Deena Afroz Yunus was born in 1986. His brothers are also active in academia. His brother Muhammad Ibrahim is a professor of physics at Dhaka University and the founder of The Center for Mass Education in Science (CMES), which brings science education to adolescent girls in villages. His younger brother Muhammad Jahangir is a popular television presenter. He studied at his village school in the early years. When his family moved to Chittagong, he enrolled in the Lamabazar Primary School. Later, he studied at Chittagong Collegiate School and passed the matriculation examination, in which he secured the sixteenth position among 39,000 students in East Pakistan. During his school years, he was active in the Boy Scouts, and traveled to West Pakistan and India in 1952. In 1955, he attended the World Scouts Jamboree in Canada as part of the Pakistan contingent. On the way back, he traveled through Europe and Asia by road. Next, Yunus enrolled into Chittagong College where he was active in cultural activities and got awards for acting in dramas. In 1957, he enrolled in the department of economics at Dhaka University and completed his BA in 1960 and MA in 1961. Following his graduation, Yunus joined the Bureau of Economics. There he worked as research assistant to the economical researches of Professor Nurul Islam and Rehman Sobhan. Later he was appointed as a lecturer in economics in Chittagong College in 1961. He was offered a Fulbright scholarship in 1965 to study in the United States. He obtained his Ph.D. in economics from Vanderbilt University in the United States in 1969. From 1969 to 1972, Yunus was an assistant professor of economics at Middle Tennessee State University in Murfreesboro, Tennessee. Yunus first got involved in fighting poverty after observing the disastrous effects of the famine of 1974. During this time, he established a rural economic program as a research project. In 1975, he developed a Nabajug (New Era) Tebhaga Khamar (three share farm) which the government adopted as the Packaged Input Programme. In order to make the project more effective, Yunus and his associates proposed another project called Gram Sarkar (the village government). The government adopted it in 1980, but the succeeding regime later lifted it. In 1976 during his visits to the poorest households in the village of Jobra near the university he discovered that very small loans could make a disproportionate difference to a poor person. His first loan consisted of US$27 from his own pocket, which he lent to 42 women in the village of Jobra, near Chittagong University, who made bamboo furniture. Previously, they had to take out usurious loans in order to buy bamboo; they then sold these items to the moneylenders to repay them. With a net profit of about two cents, the women were unable to support their families. He quickly realized that an institution needed to be created to lend to those who had nothing. However, traditional banks were not interested in making tiny loans at more reasonable interest rates to poor people, who were considered repayment risks. In December of 1976 Yunus finally succeeded in securing a loan from the government Janata Bank to lend it to the poor in Jobra. The institution continued to operate by securing loans from other banks for its projects. By 1982, the bank had 28,000 members. On October 1, 1983 this pilot project began operations as a full-fledged bank and was renamed the Grameen Bank (Grameen means "of rural area," "of village") to make loans to poor Bangladeshis. The Grameen Bank has issued more than US$6 billion to 7 million borrowers. To ensure repayment, the bank uses a system of "solidarity groups." These small informal groups apply together for loans and its members act as co-guarantors of repayment and support one another's efforts at economic self-advancement. As it has grown, the Grameen Bank has also developed other systems of alternate credit that serve the poor. In addition to microcredit, it offers education loans and housing loans as well as financing for fisheries and irrigation projects, venture capital, textiles, and other activities, along with other banking services such as savings. As clients repay their smaller loans first, they become eligible for larger loans, with the house-loan at the maximum level. Loans are made against a business plan. Bank workers go to the villages and assist with the loan process. Clients do not have to visit the bank. The bank is itself governed by the poor, whose terms of office expire once they have achieved financial independence. About 94 percent of the bank is owned by its borrowers. The government of Bangladesh owns 6 percent. The success of the Grameen Bank model has inspired similar efforts throughout the developing world and even in industrialized nations, including the United States. The Grameen model of micro financing has been emulated in 23 countries. Many, but not all, microcredit projects also retain its emphasis on lending specifically to women. More than 96 percent of Grameen loans have gone to women, who suffer disproportionately from poverty and who are more likely than men to devote their earnings to their families. Muhammad Yunus was awarded the 2006 Nobel Peace Prize, along with Grameen Bank, for "their efforts to create economic and social development from below." Some have suggested that Yunus could have been awarded the Nobel Economics Prize, which carries more weight in some circles as it lacks the political controversy that often clouds the Peace Prize. However, recognition that while millions in the world remain poor, just societies—which are the necessary foundation for peaceful societies—remain a dream in many parts of the world. Without access to adequate education, as well as freedom from poverty, the quality of civil society upon which democracy stands cannot be formed. Grameen Bank awards about 30,000 scholarships every year enabling children to attend school. The award of the Nobel Prize to Muhammad Yunus recognizes that until the world is also a just world, peace will prove difficult, if not impossible, to achieve. In awarding the prize, the Norwegian Committee also spoke of building bridges between the West and the Islamic world. 2004—Winner of The Economist newspaper's Prize for social and economic innovation. 2006—Mother Teresa Award instituted by the Mother Teresa International and Millennium Award Committee (MTIMAC), Kolkata, India. 2006 - "Freedom from want" Award, one of the Four Freedom Awards; Roosevelt Study Centre. Additionally, Yunus has been awarded 27 honorary doctorate degrees (all but one a doctorate), and 15 special awards. The Grameen Bank website includes a list of awards received by Professor Muhammad Yunus. Former U.S. president Bill Clinton was a vocal advocate for the awarding of the Nobel Prize to Muhammad Yunus, although he assumed it would be for economics, not peace. "Muhammad Yunus should have been awarded the Nobel Prize in Economics years ago." In July 2007 in Johannesburg, South Africa, Nelson Mandela, his wife, and Desmond Tutu convened a group of world leaders to contribute their wisdom, independent leadership and integrity together to the world. Mandela announced the formation of this new group, The Global Elders, in a speech he delivered on his 89th birthday. Archbishop Tutu serves as the Chair of The Elders. The founding members of this group include Muhammad Yunus, Kofi Annan, Ela Bhatt, Gro Harlem Brundtland, Jimmy Carter, Li Zhaoxing, and Mary Robinson. The Elders are to be independently funded by a group of Founders. Yunus was judged one among the ten most famous living Bengali personalities in a poll organized by Muktadhara New York. The Grameen Phone telecommunication project has evolved to become Bangladesh's biggest private phone company. Grameen Phone is now the leading telecommunications service provider in the country with more than ten million subscribers as of November 2006, according to Grameen Phone website. The Grameen Phone (Village Phone) (পল্লি ফোন, polli fon) project is another brainchild of Dr. Yunus that aims to bring phone connectivity to the rural population of Bangladesh, and at the same time give entrepreneural opportunities to rural women. Village Phone works by the basic idea of providing small amount loans to rural women to buy cellular phones to set up "public call centers" at their homes. Income generated by the call centers is used to pay off the loans. This was a project where students could take courses on currently needed sectors; they could also use this as a source. Grameen took this step to prevent foreign multi-level marketing (MLM) firms from rushing into Bangladesh. To build on the tradition of self-sufficiency, Dr. Yunus started a trend to wear simple garments made from locally-handwoven cotton, modeled after Indian Madras plaid, known as "Grameen check." He also always wears Grameen Check. Not only is wearing this a popular trend spanning all classes of people of Bangladesh, especially in the capital Dhaka, but export of Grameen Check has spread to other nations. There are dozens of Grameen-based showrooms all over the country. ↑ Ole Danbolt Mjøshttp, Presenting Speech: The Nobel Peace Prize, 2006. December 10, 2006. Retrieved June 16, 2007. ↑ Muhammad Yunus, Banker to the Poor, or: Micro-lending and the battle against world poverty (NYL Public Affairs, 1997, ISBN 9781891620119), 20-29. ↑ 3.0 3.1 "Citation for Mohammed Yunus," Ramon Magsaysay Award Citation. Ramon Magsaysay Foundation, 1984. Retrieved June 17, 2007. ↑ Muhammad Yunus, Banker to the Poor (NYL Public Affairs, 1997, ISBN 9781891620119), 46-49. ↑ Profile: World Banker to the Poor BBC, October 13, 2006. Retrieved June 16, 2007. ↑ George Negus, "Interview with Professor Muhammad Yunus." Australian Broadcasting Corporation World in Focus, March 25, 1997. Retrieved June 17, 2007. ↑ Awards Received by Grameen Bank. Retrieved August 14, 2007. ↑ Jim Boulden, "The Birth of Micro-credit". CNN, March 29, 2001. Retrieved June 17, 2007. ↑ Bill Clinton, My Life (NY: Random House, 1994, ISBN 9781400030033), 533. Yunus Centre - Yunus Centre Website web site. Muhammad Yunus Receives the 2006 Nobel Peace Prize - A Photo Essay by Scott London. World's Banker to the Poor - A BBC Profile.